It’s extraordinary when you think of it. Sir Peter Shaffer, author of the Tony award-winning play Equus, is watching a rehearsal for the upcoming revival of his play at the John Drew Theater in East Hampton… and he’s taking notes. He’s listening to the words he wrote over 35 years ago as if he were hearing them for the first time. Why? Because he’s still writing. 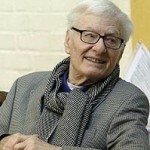 At the age of 84, this esteemed English dramatist, author of Amadeus, The Royal Hunt of the Sun and Lettice and Lovage among scores of others, is doing re-writes on one of his most successful plays – maybe even one of the most groundbreaking plays of the last half a century. Inspired by a real-life crime that Shaffer read about in a small town newspaper, Equus tells the story of a British psychiatrist wrestling with questions of passion and purpose while treating a disturbed teenaged boy who has violently attacked six horses. And although this production stars Alec Baldwin as the psychiatrist, British newcomer Sam Underwood as his patient, and is directed by Theatre-Hall-of-Famer Tony Walton, the real star in the rehearsal room today is Mr. Shaffer himself, and the multi-award-winning opus he continues to polish. Granted, there is nothing unusual about a playwright being in the rehearsal room. Authors of new plays frequently make changes during the period leading up to production. But once a play has been produced on Broadway, received multiple Tony Awards, been published, and then adapted into an Oscar-nominated film directed by Sidney Lumet, you might think the script was finished, “frozen,” as it were, as the definitive roadmap for any productions (and there have been many) to follow. Not so here. I am playing the role of the boy’s father in this production, and two days before rehearsals began, I received a whole new page of dialogue. The new scene clarifies some of my character’s underlying motivation, and is of enormous help to me. Other actors in our company have received equally significant adjustments to their scenes. But what Shaffer is doing by picking up the pen at this stage in his, and the play’s, life, is not just a remarkable act of dedication to theatre, it is a profound act of courage. The young boy at the heart of the play has constructed a theology around horses – he literally worships them, and his actions call into question the psychiatrist’s own experience of faith and feelings about the passionate life. “That boy has created out of his drab existence a passion more ardent than any I have known.”, says the Doctor. in one of the play’s more memorable moments. “I feel a kind of envy.” Why has this great playwright chosen to tempt the gods of theatre at this stage in his – and the play’s – life? In fact, one can only imagine that the potential discoveries that might result from bringing thirty-five additional years’ perspective to the table would, for Shaffer, bring rewards worth the risk. Win or lose, Shaffer’s willingness to continue exploring Equus is an inspiring lesson for us all… not just in the art of playwriting, but in the art of living. Would that we all had the courage to keep listening, within and without, to the narrative of our lives, remain open to its lessons, and be ready to continue re-writes. Or go online to www.guildhall.org.